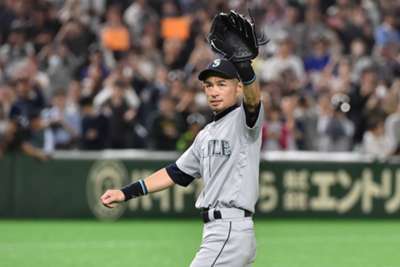 Ichiro Suzuki has announced his retirement from baseball after helping the Seattle Mariners' to a 5-4 victory over the Oakland Athletics in Tokyo. Word of the impending announcement had already leaked out prior to Thursday's match, and emotions ran wild as the 45-year-old confirmed the news following Seattle's win in 12 innings at the Tokyo Dome. In what would prove to be his final at-bat, Ichiro made everyone hold their breath as he hustled down the line after a soft grounder to shortstop. He did not beat the throw, however, to end the top of the eighth inning. He trotted to right field for the bottom half of the inning, but Seattle manager Scott Servais stopped the game before a pitch was thrown to pull Ichiro and give the crowd a chance to honour one of the greatest players in history. "I have achieved so many of my dreams in baseball," Ichiro said in a statement. "Both in my career in Japan and, since 2001, in Major League Baseball. "I am honoured to end my big league career where it started, with Seattle, and think it is fitting that my last games as a professional were played in my home country of Japan. "I want to thank not only the Mariners, but the [New York] Yankees and [Miami] Marlins, for the opportunity to play in MLB, and I want to thank the fans in both the U.S. and Japan for all the support they have always given me." Suzuki — who was the AL MVP and Rookie of the Year for the Mariners in 2001 — has played 14 of his 18-plus MLB seasons in Seattle. He will finish his career with 3,089 hits in MLB (23rd all-time) and 1,278 in Japan. His combined total of 4,367 is a world professional record. The Baseball Hall of Fame announced immediately after the game that Ichiro will be eligible for induction in 2025, and he'll have a resume worthy of first-ballot enshrinement as a 10-time MLB All-Star and 10-time Gold Glove winner. After he finally left the field for good, Ichiro summed up the night to reporters: "It doesn't get better than this. There's no more happiness than this here tonight."